“I’d like a skinny vanilla latté, extra foam extra whip cream! 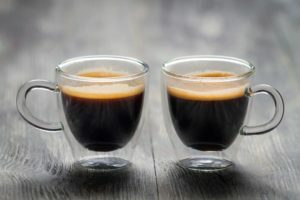 !” One of the first questions I get from a lot of nursing moms is, “when can I drink coffee again?! ?” Some doctors don’t have a problem if moms drink one a ounce cup of coffee throughout the entirety of the pregnancy. Other moms because of risk factors are told not to have any until after the babies born. Whether you have coffee or not during your pregnancy, there are a few things to know before introducing it after your baby is born. 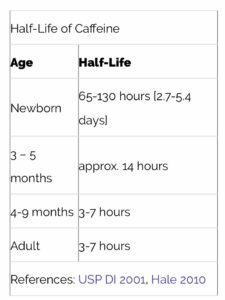 The first is that it affects infants differently than adults. The following chart was taken from Kelly mom.com. It shows the half-life of caffeine in the bloodstream. I was surprised that Caffeine will stay in the bloodstream of the brand newborn for an average of up to five days! Their sensitivity to caffeine decreases as they age. Signs of sensitivity are hyperactivity, difficulty sleeping or sleeping for long periods of time, jitteriness, irritability, and fussiness. If you drink coffee during your pregnancy, you might not see as much of an impact on activity levels in your baby if you continue to drink after birth. However if you have stained from college and your pregnancy, you may notice changes in your baby. Per Medications and Mother’s Milk (Hale 2017, p. 139-140) caffeine is in Lactation Risk Category L2 (safer); milk levels are quite low (0.06-1.5% of maternal dose) and usually peak 1-2 hours after ingestion. 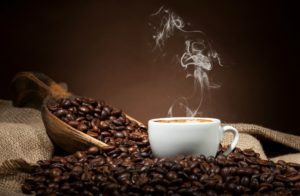 The American Academy of Pediatrics has classified caffeine as a “Maternal Medication Usually Compatible with Breastfeeding.” If you’re iron deficient or iron deficiency rubs in your family, be extra careful. One study indicated that chronic coffee drinking might decrease iron content of breastmilk (Nehlig & Debry, 1994). We actually routinely give caffeine directly to premature babies in our neonatal unit for lung stimulation! Remember caffeine isn’t just in coffee! 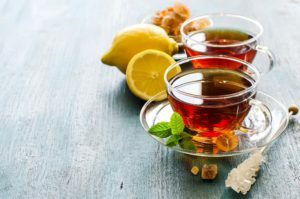 Tea, soft drinks, sports/energy drinks (including the “sports water” products), some over-the-counter and prescription medications, and foods containing coffee or chocolate can also have caffeine!! I can’t have Haagen Daz coffee ice cream late at night because it keeps me up!!! Herbal products containing guarana/paullinea cupana, kola nut/cola nitida, yerba maté, or green tea also contain caffeine. Each food and liquid has varying amounts of caffeine. Different roasts of coffee and the way that the coffee is made also impacts caffeine level. Make sure to check the caffeine level you’re ingesting by serving size to see how much you’re getting!! According to Breastfeeding Answers Made Simple (Hale Publishing 2010, p. 521), excessive caffeine consumption by the mother (more than 750 mg per day) can result in a baby who shows signs of caffeine stimulation. I typically recommend no more than one 8-ounce cup of coffee a day for nursing mothers (but as a note!! An 8-ounce Starbucks coffee has 250mg of caffeine while a non-gourmet brewed 8-ounce cup of coffee only has 120-160mg of caffeine!!!!!!) The important thing is to know your body and know your baby. Be informed of what you are putting into your body and what is going into your baby. Watch for how your baby reacts to that 1st cup of coffee and if you need to, cut out coffee for a little while longer or switch to decaf.